Ensure you list every procedure that was performed/used for the patient including BLS procedures and equipment. 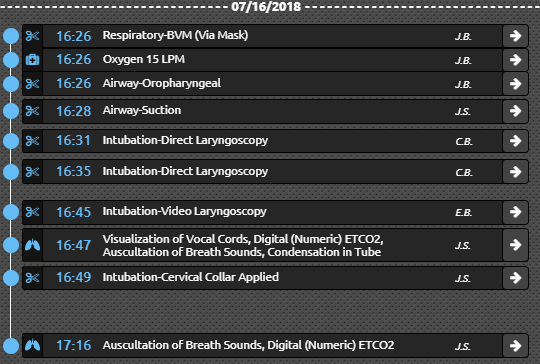 Each intubation attempt should be listed separately if you restarted bagging or another provider attempts. If you insert the blade into the mouth, remove, and reinsert, that is two attempts but with the same time/person. Use the timeline to verify the order of things and ensure nothing is missed (top right under times). You can filter for just meds, procedures, vitals, etc. to double check. Patients with an advanced airway should have end tidal monitoring documented at least every 5 min as well as other vitals. End tidal should ideally be used with BVM ventilations as well. If you double check tube placement, that should be documented as an additional ALS airway confirmation. This should be done after movements, during turnover, etc. Obtain a physician signature for advanced airway verification under signatures—Receiving Medical practitioner—advanced airway verification. You can also use the same signature for orders if needed.